It happened again folks. Two nights after the Pittsburgh Pirates blew a three-run lead to lose on a walk off home run, they would lose again in similar fashion. 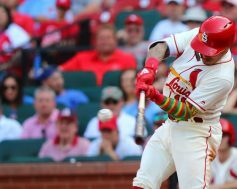 No, they didn’t blow a lead, but a bottom of the ninth home run by the St. Louis Cardinals would send them to defeat. Tonight’s loss would be by the final of 3-2. There was not much offense in this game with four of the five runs coming via the solo home run. Even with that, neither starting pitcher worked very deep into the game. Pittsburgh starter Chad Kuhl would work six innings allowing two runs on four hits with five strikeouts and two walks. St. Louis starter Luke Weaver only went five innings and gave up one run on four hits with four strikeouts. It has been a roller coaster ride of a 2018 season for Jameson Taillon and the Pittsburgh Pirates. Like his team, Taillon has shown flashes of brilliance, but also has struggled mightily at times. Entering Friday’s game at Busch Stadium, Taillon hadn’t tallied a victory since April 8, and his team desperately a strong performance after a heartbreaking loss to the St. Louis Cardinals on Thursday. 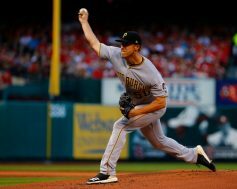 Taillon was on point on Friday, tossing eight shutout innings and the Pirates offense scattered enough runs for a comfortable 4-0 victory. 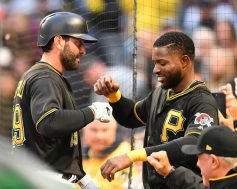 A day after making a dramatic comeback from five runs down to beat the St. Louis Cardinals on Friday night, the Pittsburgh Pirates returned to action at PNC Park on Saturday looking for yet another series victory against a N.L. Central opponent. 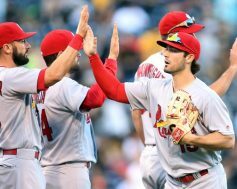 Trevor Williams battled his way through six innings, and the Pirates offense came alive in the latter innings to push them to a 6-2 victory over the Cardinals. Williams pitched six innings, giving up two runs on four hits with two walks and two strikeouts while earning his fourth victory of the season (4-1). Michael Feliz, George Kontos, and Edgar Santana each pitched an inning of scoreless relief. 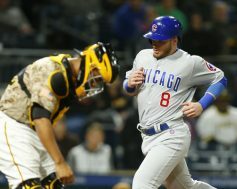 After a disappointing finale to their home stand against the Chicago Cubs, the Pittsburgh Pirates hit the road to continue their month long battle against N.L. Central division foes. 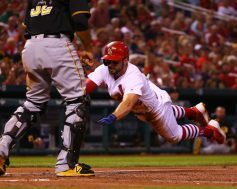 The St. Louis Cardinals still have an outside change at making the postseason, and they played like a team hungry for the playoffs, beating the Pirates 4-1 at Bush Stadium. Trevor Williams started for Pittsburgh tonight and never really settled in. He struggled with his control, and in addition to walks, he was hit hard on balls he left over the plate. He gave up four runs on four hits and four walks in 4.2 innings. His mound opponent, Luke Weaver, pitched a great game, giving up seven hits and struck out seven batters in 5.2 innings. Tonight, marked the final time in 2017 that the Pittsburgh Pirates and Chicago Cubs would do battle on the diamond. With the series squared away at nine games apiece, a win tonight would give the winner bragging rights for the season. After a quick downpour delayed the start, Chicago quickly got to work and never looked back in an 8-2 victory. Jameson Taillon had another rough outing tonight. He would only last 4.2 innings, allowing six runs on eleven hits to go with three strikeouts and one walk. I think it is time to shut Taillon down for the year. He has not looked good lately and the mid-season cancer scare had to take it out of him both physically and mentally.